When someone mentions playing bongos, you probably think of a beatnik poet embellishing his obscure poetry with flourishes on a pair of these little drums. Though this image may seem somewhat ridiculous, the role of the bongos as an instrument of improvisation and accentuation isn’t far from true. The bongos hail from Cuba and came into being within the Son style of music in the mid-1800s. Son is an organic merging of African and Spanish music from the eastern part of Cuba. The bongos were originally the only drums used in Son music and, because of their soft sound and high pitch, were played only during the introduction and verses of the songs. During the louder sections of the songs, the bongocero (the name for the bongo player in Cuba) switched his or her playing to a cowbell, traditionally called the campana. Today the bongos (see Figure 1) are one of the most recognizable of the Latin drums, and you can find their sound in all styles of music. Figure 1: The bongo drums come from Cuba. 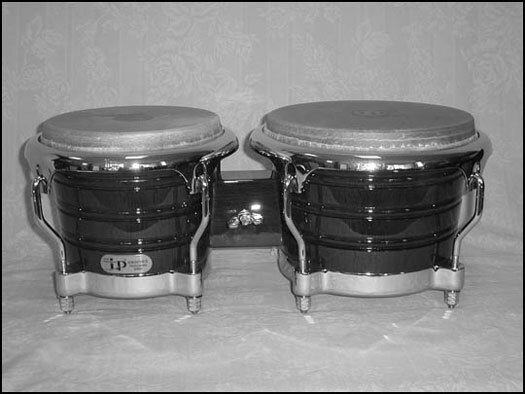 The bongos are a pair of small drums that are connected and played as a unit. Traditionally, you hold the bongos between your legs with the smaller drum on your left. Figure 2 illustrates the proper holding technique. 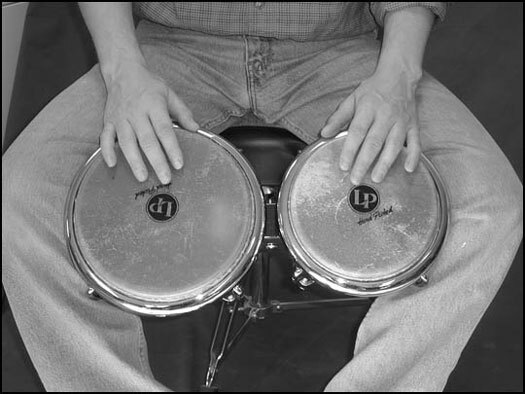 Figure 2: Traditional playing technique for the bongos. The open tone: Hit the edge of the drum with the knuckly part of your palm and let your fingers bounce off the head. Experiment by moving your fingers about 4 inches in from the center of the drum and see how the sound changes. You want a rich, clear sound without any overtones (those annoying ringing sounds that get in the way of a clear tone). The slap: Cup your fingers slightly as you strike the head to create an accent (louder) note that adds color to your drumming. After your hand contacts the drum, relax your fingers and let them bounce off the head. The slap stroke makes a “pop” sound of a higher pitch than the open tone stroke. The heel-tip movement: Rest your hand on the head and rock from the heel of your palm to the tip of your fingers. Remember to always keep your hand in contact with the head when you play this stroke. The basic muted tone: Strike the drum in the open tone fashion, but allow your fingers to rest on the head after you strike it. Keep your hands relaxed and barely move them. All you really hear with a muted tone is a light touch of your fingers against the head. Traditionally, your left hand does a heel-tip rocking movement, but most modern players choose the basic muted tone instead. The Son bongo rhythm, called the Martillo, has an improvisational quality to it. Traditional players used this rhythm as the basis for experimentation. Not too much though, because the basic 1, 2 pulse created by this rhythm is important to the overall feel of the song. If you’re going to play the Martillo in a Son group, you can’t stray too far from its basic 1, 2 pulse, or you’ll end up getting a few nasty looks. Figure 3 shows the Martillo and a few variations on the rhythm. 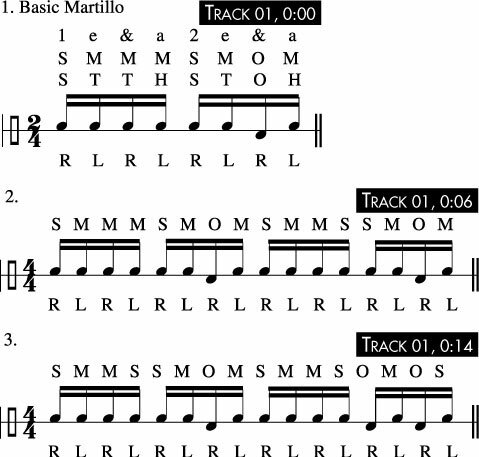 Figure 3: A few bongo rhythms: The Martillo and some variations. The basic Martillo in Figure 3 includes two hand patterns (the hand patterns are the Rs and Ls written below the rhythm). One is the traditional heel-tip pattern while the other shows the basic muted tone. Try them both to decide which pattern you prefer. The variations show only the basic muted stroke, but you can substitute the heel-tip movement instead if you choose. The first rhythm in Figure 3 is a two-beat pattern. Beats one and two (both played with your right hand) play an accented slap tone at the edge of the smaller drum. On the “&” of beat two, your right hand plays an open tone on the larger drum. In this rhythm, your left hand plays soft, muted tones to give the rhythm a sense of movement. The second and third rhythms are four-beat variations. You may not have much of a calling for playing the Martillo in a Son band, but this rhythm and its variations apply to contemporary music as well. All the rhythms in Figure 3 can fit into most pop music situations. In contemporary music, the bongos are often mounted on a stand next to the conga drums and played as an accent to the main conga beat and as a solo instrument. Because of their high pitch, the bongos work best when playing a syncopated beat (a rhythm that accentuates the “e” and “a” of a beat rather than the downbeat — the 1 or 2), especially during a solo. Experiment with the Martillo or one of its variations and add more left-hand accents. Doing so gives your rhythm a syncopated feel. For contemporary music, you can even eliminate the right-hand accents once in a while.